From the end of the First World War to 1979, municipal housing promised to sweep away the old slums and to replace the exploitive slum landlord with a public body to be trusted. At different periods throughout most of the twentieth century, progressive policies attempted to provide new homes that would meet general needs on a series of new estates, and to sweep away and redevelop Slumland. The local authority faced a series of problems. Legislation, the economy and resources, the land-trap and the scale of the housing crisis faced by the council provided a number of complex challenges. On one level, their efforts can be applauded. Slums were cleared and Manchester managed to curtail the high rise horror that proved a disaster for other cities. Yet, on another level, in the end municipal housing policies re-created the same problems which they had inherited. They built estates, cleared entire areas and, in central areas, redeveloped old communities. In doing so, they used new modern designs and building techniques. However, many of these were not only wasteful, unattractive, badly designed and deeply unpopular but they reinforced social segregation. The buildings changed but the social problems and cultural perceptions remained. Although economic problems and changes underpinned the process, housing policy did nothing to challenge the social divide. Rather, it combined with the social and economic issues to reinforce resident isolation through association and negative stereotypes. Peter Shapely is modern and contemporary British urban historian. relations, policy creation and implementation and local governance. Health and Hospitals in Post War Manchester: What Difference Did the NHS Make? Without WWII, British health services would probably have continued to be run largely by the Local Authorities, as Manchester Council had hoped. Without the Labour victory in 1945, the City would probably have retained its big (ex poor-law) hospitals, and the teaching hospitals would probably have gained state funds, distributed through a local/regional co-ordinating body, as pioneered in Manchester in the 1930s. So what did happen in terms of ownership and control? Who ran the early NHS in Manchester, and what were they able to do in a period of shortages, when increases in expenditure went mainly to education and housing, and then from the early 1960s when hospital building became a priority? For a city/region with some powerful national players, we will explore the ground level consequences of formative national politics. development of biology and medicine in the University. This talk will look briefly at the decline of the port of Manchester and the textile industry within the city, and the impact of new commercial developments on the city townscape (such as the Arndale). This period also saw the beginnings of interest in Manchester’s industrial past. This will be reviewed from the first industrial archaeology dig and the retention of the Shambles, to the saving of the Liverpool Road Railway Station site. Dr Michael Nevell is Head of Archaeology at the University of Salford. He is an industrial Archaeologist with more than 25 years experience, is co-editor of the international journal Industrial Archaeology Review, has written many books on the archaeology of the North West, and has occasionally appeared on Channel 4’s Time Team. Manchester, however, was also a catalyst for change (albeit slow). Mancunian Charles Gandy, chairman of the National Smoke Abatement Society (NSAS), came up with the concept of the smokeless zone following a winter smog episode in 1931 that resulted in over 450 ‘excess deaths’ in the city. In advance of national legislation, the NSAS worked together with the City Council’s Health Department to create one of the first experimental smokeless zones. But planning was disrupted by the Second World War, and the commercial centre of the city did not become an operational smokeless zone until May 1952. Manchester’s smoke control programme would not be fully completed until the 1980s, by which time most of its blackened buildings had been cleaned. Clearing the skies of smoke, however, was to have unintended consequences, as a new air pollution problem soon arose. As sunlight penetrated Manchester’s streets it reacted with automobile exhaust emissions to create hazardous photochemical smog, especially during the summer months. In January 1995, The Guardian claimed that Manchester had the ‘foulest air in Britain’ as 65,000 cars crawled into the city centre during the rush hour. In June the same year, as asthmatic admissions to hospitals increased, the Manchester Evening News alleged that because of choking traffic fumes living and working in the city and its conurbation could ‘seriously damage your health’. Manchester’s skies have now cleared, but its air is not yet clean. Stephen Mosley is Senior Lecturer in History in the School of Cultural Studies at Leeds Metropolitan University. His publications include: Common Ground: Integrating the Social and Environmental in History (Cambridge Scholars Publishing, 2011 with Geneviève Massard-Guilbaud); The Environment in World History (Routledge, 2010); and The Chimney of the World: A History of Smoke Pollution in Victorian and Edwardian Manchester (Routledge, 2008). He is also the editor of the journal Environment and History. He is currently working on a global-scale history of pollution problems for Reaktion Books. The Mancunian Way (A57M) is a mainly elevated running 0.6m in an East-West direction, located just south of Manchester city centre. 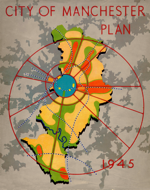 Planning for the route began with the 1945 City of Manchester Plan, which envisaged the Mancunian Way, or Link Road 17-7 as it was initially known, forming part of a new system of arterial routes and ring-roads linked to a regional communications network. The route was later incorporated into SELNEC’s 1962 Highway Plan and construction began in 1964. Promoted as the Highway in the Sky, the Mancunian Way was to solve problems of traffic congestion. Cutting a swathe through the Victorian industrial landscape, the road was to be a symbol of a progressive and modern city. In contemporary Manchester, however, the Mancunian Way, occupies a very different discursive space. Rather than a symbol of optimism, it has a signifier of urban problems. Within 15 years of opening, Manchester Docks closed and the industrial hinterland it served was largely derelict, undermining the primary functionality of the highway. Rather than a fluid space for car drivers to effortlessly traverse the city, the Mancunian Way is acongested obstacle. But as our empirical observations, drawn from a series of tours that counter-intuitively attempted to walk the route of a motorway, show that this environment also produces affordances in terms of creativity and unconventional use. Utilizing Ritzer’s (2002) assertion that rationalised systems also produce irrationality, this paper therefore, maintains that scientific planning based on principles of calculability and predictably, will also produce apparently irrational decisions and unintended, sometimes random, consequences. Dr Steve Millington is a Senior Lecturer in Human Geography at Manchester Metropolitan University. He is co-author of two edited collections, Cosmopolitan Urbanism and Spaces of Vernacular Creativity: Rethinking the Cultural Economy, both published by Routledge. His current research focuses on the relationship between light, space and society. Steve is also a member of the Manchester Modernist Society. Faced with further industrial decay, Manchester in the 1960s desperately tried to shake off its dour northern heritage in order to recast itself as a commercial centre. Wythenshawe, eight miles south of the city centre, was an important part of this vision of commerce. Its fringe location and satellite garden town design set it apart from the rest of the city and the promise of free-flowing traffic, greenfield sites and generous grants incentivised a number of businesses to relocate. Three businesses that moved operations to the area – Shell-Mex British Petroleum, Barclays Bank, and the Trustee Savings Bank – created large computer centres in Wythenshawe’s newly-built civic centre. The buildings’ Brutalist designs, typical of building projects at the time, dominated the surrounding area and architects rose to the challenge of humanising the buildings’ visual identity by setting them in open landscaped grounds. In this paper, I examine the relationship between these buildings and the community in which they were situated to understand why, despite the computer centres’ planned open outlooks, the buildings were increasingly fashioned as very private places. Ian Martin is a senior lecturer in Business Information Technology at Leeds Metropolitan University. His research interests include spatial and temporal perspectives on the history and sociology of technology. His PhD thesis from the University of Manchester in 2010, Centring the Computer in the Business of Banking: Barclays Bank and Technological Change, 1954-1974, is a labour history of early computing work. The Manchester Blitz of December 1940 destroyed or seriously damaged hundreds of commercial and residential buildings within a mile radius of Albert Square. Within days of this devastation plans for the post-war reconstruction of Manchester were being discussed. But the scope of these plans and the future they envisaged went far beyond making good the damage caused by the Luftwaffe. The eventual result was the wide ranging and ambitious City of Manchester Plan of 1945 prepared under the jurisdiction of city surveyor and engineer Rowland Nicholas. This paper will explore the wartime debates over reconstruction that culminated in the Nicholas plan of 1945. Alan Kidd is Emeritus Professor of Social & Regional History at MMU and among my publications is Manchester: A History, published by Carnegie.